Recently due to a blog out on the internet we had a deluge of people coming to the topical info forum expounding on their horror of people trying to deal with skin cancers in a DIY ( do it yourself ) method. Some were sincerely concerned and polite...some were outright rude and obnoxious. 2. She was someone who reacted differently ( maybe allergic) to Bloodroot paste. 3 She bought some bogus bloodroot paste that was either something else or mixed improperly. The main reason the blog brought people to Topical was they also wrote about our dear member Hoxey who had a very rough go of bloodroot paste on her nose..
Again with Hoxey she started posting here AFTER she had already applied the bloodroot paste and was asking for advice on if what was happening was "normal"
The why and hows of Hoxey's experience are probably (my guess) is that unfortunately her cancer actually ran that deep. It is not the norm but it definitely happens. This all said a lot of talk has gone about here, most hearsay and second hand about bloodroot paste. I am one of those that has spoken on it in this fashion. I did a ton of research on the net almost 14 years ago before I ever did my first application. I also hunted people down who had posted on the net and called them and talked to them personally. I knew I had read that Dr. Mohs originally used bloodroot paste but recently a lot of articles on the net imply he only used Zinc Chloride. The recent assault here by the bloggers prompted me to get fresh facts and in my most recent research findings I started to believe that perhaps I had been misinformed originally, maybe it was just zinc chloride. Today I finally found an extremely well documented article..on skincancer.org..It is called "The Evolution of Mohs Micrographic Surgery" and is definitely the most concise to date on the history of Mohs surgery. Unlike most articles out there today..though he only mentions Sanguinaria Canadensis ( Bloodroot) once, it is clear what the alternative community is calling bloodroot paste is very close to what Dr. Mohs was using to "fixate" his lesions 24 hours before excision. It is written by a doctor who worked with Dr. Mohs and who was the driving force for stopping the use of bloodroot paste. It wasn't because bloodroot paste was bad, it just was a longer procedure and perhaps a little more painful than just numbing the area, excising, freezing and the examining microscopically. It is actually a patent for a peel away strip / applicator of the bloodroot paste but talk about a detailed peek into the product WOW! Rather than keep posting new threads I'll just keep adding to this single post..
Below is a link to Dr.Norman Brooks a dermatoligist in Encino, California who published a study in 2010 that concluded that "Zinc Chloride fixative paste" (Mohs version of Bloodroot paste as per the patent link above) is still the best tool in excising MELANOMA tumors...That is how good the stuff is...HERE is the link. I can not tell you how many dermatologist I have spoken to who were completely unaware of bloodroot paste and eluded I was foolish to consider using it...I can't think of one who knew... they were amazed when they saw my pictures. Clearly shows that our medical system is not all what it is cracked up to be...How can they not know is the question? It seems almost irresponsible for them not know about it. Here's an interesting article on the life saving coagulating properties of bloodroot paste that I've personally observed and mentioned elsewhere on this site. I saw that article and decided to put the video onto www.canceramerican.com . There is also the natural doctor video about chemotherapy being useless (97%) of the time and a quite graphic recovery video from another bloodroot user. My latest pic is now at the bottom. I wish I had been in better shape neurologically through all this, suckers are gonna turn of my gas at home now unless I find a way to get some donations or something. I have saved all these links, anivoc. Bonder, I hope you're ok. Sending you caring thoughts before I continue with my desperate surfing. I've had skin issues (my lips) for years, and I realize now, I had better get educated on my on. Btw, I tried to link through to canceramerican.com but it was a no go. Greetings, www.canceramerican.com has a whole lot of information on it with lots of videos so, it may be tough on some computers but, most will be just fine. Recently I decided to build a site that is lighter and only has a few videos on it (for now lol) It also has a livestream chatroom there and anyone can use it, all they need is to create a nickname and start typing. ( http://integrativecancersociety.com ). My latest bit of information is a video from a doctor that basically says cancer is (not) a genetic disease and that it can be helped greatly by changing your diet. So, If a person has the alkalinity of orange oil or something to put on their face and changes their diet, their skin tumor will probably recede like my friend's did a few months ago. Obviously, there are no guarantees. Between that video and the one about cancer doctors (not) using the Dr Mohs topical pastes, it really makes you wonder what the medical community has been doing all this time with cancer ?? At the suggestion of anivoc, I have been going through some of the information about bloodroot, and associated preparations � primarily what is called �black salve�. Just to be clear, "black salve" is not necessarily the same as the active ingredient (sanguinarine in the main, but with the addition of other plant extracts some of which contain other active ingredients, (eg. Berberine). These do not always have the same biochemical properties, but many extracts (including sanguinarine) are from a group of chemical compounds called quaternary ammonium salts, in other words, they all have a structure which includes a Nitrogen ion (positively charged, linked to other organic chains or hydrogen (NH3 being ammonia, and NH4+ being ammonium). All of these compounds have varying degrees of anti-microbial, and other cytotoxic (cell killing) properties. And this is why some of them are found in anti-septic preparations eg. Mouthwashes. The other primary ingredient � zinc chloride is a simple salt, which can be corrosive and has industrial and biological applications. Again � in dilute form can be used as an anti-septic. The product that is promoted as a skin cancer therapy (cansema/black salve) is usually zinc Chloride combined with sanguinarine via bloodroot extract, plus other substances. The other use is as a tissue fixative � which is where the Mohs chemosurgery application fits � but that is really the subject of another post (at least one). There is a lot to talk about when considering the potential application of these products (indeed this is one of the main areas of discussion in these forums), but I really only want to address two claims (or myths) about bloodroot/black slave in this post � and will follow up other issues in future posts. I have noted that there are a few other �sceptics� posting on this forum. In some of these, I detect a dismissive or aggressive approach to people who have used or wish to use or believe that there are benefits from black salve. On the contrary, I support a person's right to choose, but also want to make sure that is an informed decision, and the facts come through the often confusing and contradictory claims made on all sides. If in doubt � rely on the science � that means what is the evidence, and what is the mechanism � magic doesn't exist, and if we don't know the mechanism, then we really don't understand the process. Also remember the easiest person to fool is yourself. The first claim I think needs to be countered is that that these products do not attack or damage healthy cells, and the second is that it will seek out and destroy all malignant or cancerous cells. This second claim I do not believe is one that all of the contributors to this site make, but certainly there are promoters of black salve who make this claim purportedly to advance the notion that this is a superior mode of therapy to other means � typically surgery etc. 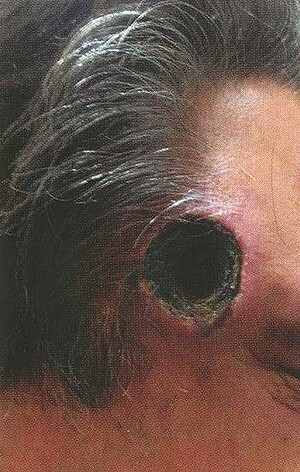 In this case report the person had apparently repeatedly applied black salve to a lesion over some time � unclear if this was weeks / months, but this had inevitably resulted in the destruction of the tissue in this uniform circular fashion, clear evidence of an indiscriminate process simply destroying organic tissue in proportion to the quantity and time of application of the material. Now in this case, there could well have been a skin cancer which was the original target, and this may well have reacted preferentially. Once the skin integrity was breached, destruction of healthy tissue occurred, particular with repeated applications � perhaps in the mistaken view that continued reaction indicated further cancer beyond the initial lesion. At the cellular level, sanguinarine acts on the Sodium/Potassium pump. Potassium being the main INTRA-cellular ion, and Sodium EXTRA-cellular. To maintain normal cell volume and resting potential, the Na/K pump moves potassium into the cell, and Sodium out, creating the resting potential, and a Sodium gradient, which then allows other biologically active chemicals � such as glucose to be transported into the cell. Failure of the pump results in an influx of Sodium, which brings water with it, the cell swells and eventually ruptures. There is nothing specific about this process � given sufficient concentration of sanguinarine, all cells will blow up and die in this manner � as demonstrated by the unfortunate individual in this case. The other important claim about sanguinarine / black salve is that it actively seeks out and destroys cancer cells. Now this could be quite a useful feature � even if there was some collateral damage along the way. But again the evidence for black salve is found wanting. I have referenced previously the NZ medsafe website (http://www.medsafe.govt.nz/safety/EWS/2013/black-salve.asp), which clearly demonstrates a number of cases where treatment with black salve failed to eradicate all of the tumour. Of course, critics could claim that this is selective reporting, and that this only focuses on a small number of �failures� while ignoring many successes. By the way, one failure is all that is needed to disprove the claim. Nonetheless, the evidence is there that treatment with a sanguinarine / ZnCl compound did not always result in total eradication of a cancer � and required further treatment. It is up to proponents to provide credible counter evidence (ie. Successful documented treatments, taking into account intention to treat, drop outs, conversion to alternative treatment, lost to follow up, etc. etc. - in other words all the things expected from properly conducted research projects). Now I will be the first to admit that not all RCTs (Randomised Controlled Trials) of conventional therapy meet the highest rigorous standards, but that is the goal. An important thing to note is that one off testimonials are the worst form of evidence � prone to bias and lacking any form of control. Sanguinarine/black salve - is it cancer specific and 100 % effective? No way � both of those myths are well and truly busted. The challenge for black salve proponents is to demonstrate that its cytotoxic effect can be sufficiently harnessed and preferentially directed to malignant cells (and the MECHANISM UNDERSTOOD) before its credibility as a superior skin cancer treatment can be advanced. As always � consult an experienced skin cancer professional � one with an open mind and a willingness to engage. That, incidentally is my objective. Thanks for reading. Thanks for reporting back Dr. Pete . It makes sense what you are saying about zinc chloride paste / bloodoroot paste ( based on Mohs recipe ) would eat away at even healthy skin given enough time.. The point is that in one 24 hour application on healthy skin it won't. The untruths that are spread around the internet that it will eat away at both healthy and unhealthy tissue at the same rate is just not factual and makes people who otherwise might have tried it, not. In regards to it's effectiveness being 100% ...of course that would not be true. As you well know, there is not a single skin cancer "remedy or treatment" other than amputation, that provides a 100% success rate so I guess they are all failures. All this smoke and mirrors nonsense out there that makes it seem like bloodroot paste is an evil dangerous scam created by snake oil salesman to rip off desperate people is very frustrating. The truth is Dr. Fredrick Mohs endorsed its use himself. How much more credibility is needed? You again provided the link to the Medsafe site that I pointed out has irresponsibly stated there were no clinical trials..After reading what I shared with you, you now know that is not true... Why would you encourage people to read that sites information? I am sure there is good data there but it is clear their objective is to scare people away from considering using bloodroot paste. After all you have read do you still feel bloodroot paste is a bad idea? DR. Brooks ( the Physician in Encino,California) has and found it incredibly powerful... Perhaps you can write or call him and get his perspective.. Thanks for the post by anivoc, and good to have this exchange as I am sure it will encourage more critical thinking on both sides. There are a lot of issues to cover so I will leave some of this to further posts - esp re: Dr Brooks as I will follow up either directly with him as suggested or through his published research which I started to track down today - but there is only so many hours in a day etc. etc. But I just wanted to address anivoc's comment about the NZ medsafe website, and to state my aim is not to explicitly endorse their view, but to the list of case reports / references which is summarised on their website which demonstrates some evidence of failure of bloodroot. I would agree that there is evidence that sanguinarine/ZnCl is effective in eliminating skin cancer in some cases, I just have issue as to whether this is as safe and effective as conventional methods � but then that is the purpose of posting on this thread after all. I would also point out that the NZ medsafe website is also obviously incorrect in listing Curaderm as a name which might be used to refer to a sanguinairine/ZnCl compound. Curaderm is (usually) a combination of an eggplant extract (solasodine glycoalkaloids) and salicylate in a cream or emulsion, that has some evidence as effective against superficial BCCs and SCCs and actinic Keratoses. There are other threads about curaderm on this forum so we don't need to go into that any more here. But I would think the Kiwi Medsafe website - despite their factual errors, or potential misleading statements discussed above, shouldn't be described as irresponsible. This is the formal advice from a government regulator. I think they are justified in cautioning against using a product that has not been submitted for evaluation as a therapeutic product, for which quality is variable, and based on the evidence they have, for which valid risk has been demonstrated in some cases. Eastman KL, McFarland LV, Raugi GJ. 2013. A review of topical corrosive Black Salve.�Journal of Alternative and Complementary Medicine�18: DOI: 10.1089/acm.2012.0377. Eastman K, McFarland L, Raugi G. 2011. Buyer beware: a black salve caution.�Journal of the American Academy of Dermatology�65: e154. Osswald SS, Elston DM, Farley MF, et al. 2005. Self-treatment of a basal cell carcinoma with "black and yellow salve".�Journal of the American Academy of Dermatology53: 509-511. Brown CW, Goldstein GD, Birkby CS. 2001. Auto-mohs.com.�Dermatologic Surgery�27: 975-978. McDaniel S, Goldman GD. 2002. Consequences of using escharotic agents as primary treatment for nonmelanoma skin cancer.�Archives of Dermatology�138: 1593-1596. Saltzberg F, Barron G, Fenske N. 2009. Deforming self-treatment with herbal "black salve".�Dermatological Surgery�35: 1152-1154. Jellnek N, Maloney ME. 2005. Escharotic and other� botanical agents for the treatment of skin cancer: a review.�Journal of the American Academy of Dermatology�53: 487-495. Laub DR. 2008. Death from metastatic basal cell carcinoma: a herbal remedy or just unlucky.�Journal of Plastic Reconstructive and Aesthetic Surgery�61: 846-848. Cienki JJ, Zaret L. 2010. An internet misadventure: bloodroot salve toxicity.�Journal of Alternative and Complemenary Medicine�16: 1125-1127. Affleck AG, Varma S. 2007. A case of do-it-yourself Mohs' surgery using bloodroot obtained from the internet.�British Journal of Dermatology�157: 1078-1079. From there, links and author searches can lead to a wider set of references. My advice is to go the source material, and critically examine what it says (eg. Case report, prospective trial, retrospective review, meta-analysis, �). As I said, this clearly demonstrates that bloodroot/black salve is NOT 100% effective. Point taken that anivoc and others on this forum are not part of the group of people that thinks bloodroot is 100% effective and 100% specific to cancers. However it is worth emphasising this repeatedly, because it is a claim I have heard from patients and also some who post on this forum � no names mentioned here you know who you are. Just to finish my thoughts on bloodroot/ZnCl paste and then others can have a say, I would like to discuss Dr Mohs and more recent Dr Norman Brooks who have been associated with its use in their medical practice. The main issue here is that both are / have been using it as a tissue fixative, so its role is as part of a surgical procedure for margin control. Irrespective of any cytotoxic or immunomodulating effect � which is a completely separate issue, Dr Mohs was a surgeon, and his methods were always to surgically remove cancers, and examine the histology to ensure its complete removal. The role of bloodroot/ZnCl is not a critical factor in eradication of the cancer, it is there to preserve the tissue and enable it to be examined. From the link provided in anivoc's original post � the development of Mohs surgery eventually led to fresh tissue sections becoming the norm (ie. No use of tissue fixative � whether ZnCl//bloodroot or any other). This was because it was equally effective, but also enabled more rapid treatment. Incidentally the fresh section method began to be used when an eyelid lesion was treated, and it is important to avoid use of ZnCl because of risk to eye / vision. I have emphasised this point a couple of times already on this forum � skin cancers in areas around the eye or eyelid are difficult and use of topical treatments should always be avoided. Most treatment of Melanoma is not using Mohs techniques but simply wide excision plus further excisions of margins based on current guidelines. Mohs surgery is also the minority treatment for other skin cancers, for financial reasons � many patients cannot afford the procedure, and are willing to accept higher risk of recurrence where margin control is not as good as in the Mohs technique. Note Dr Brooks own words � FOLLOWED BY WIDE EXCISION � surgery is essential in treating melanoma! I have to call anivoc on this as the post was misleading to say it �.... is still the best tool in excising MELANOMA tumours ...� Wrong! A scalpel is the best tool for excising anything, the bloodroot paste is used as an adjunct to fix the tissue. It is important to understand the research here � not just look at what some one claims it means in a media report. This was a controlled study using known genetic strains of melanoma cells which were introduced into mice. One of the melanoma strains is poorly immunogenic, the other strongly immunogenic. Initial tumours were either treated with ZnCl paste then excised or simply excised without treatment. 7 days later melanoma cells were injected to a distant site. In the strongly immunogenic strain, fewer melanomas developed at the distant site in the ZnCl group, with no difference in the poorly immunogenic strain. An interesting study for sure, but also one that has NOT been replicated by other researchers, and again I would ask � what is the postulated MECHANISM. If we don't understand how it works, how can we be sure of replicating it and operationalising it. So, at best we have ONE study indicating a POSSIBLE effect of ZnCl on immune stimulation for certain strains of melanoma. Also remember it was unclear to me whether this is ZnCl only here, without bloodroot or sanguinarine additives, although I only had access to the abstract of the papers, and the news article was ambiguous. In the 2010 news article, Dr Brooks declares no relevant financial disclosures. Now in theory that may be correct if the patented applicator has never been manufactured, marketed or sold, but it clearly indicates a potential conflict of interest. Come on guys & gals � tell me you didn't know this � because witholding information about potential commercial interests where it might influence perceptions and research outcomes is serious stuff. As they say � it is not a good look, no matter what the merits of the research. If there is even a perception that he has a stake in any business that might spin off, it colours the interpretation of his work. Remember Andrew Wakefield � the disgraced English physician whose �research�, which eventually was shown to be fraudulent, and which caused incredibly unjustified panic about links between autism and MMR vaccine, was later revealed to have commercial dealings with autism interest groups, and had himself taken out a patent for single vaccines (in competition with the combined MMR vaccine). You have to do your homework, and look into these issues. For all I know, Dr Brooks is a good surgeon and as I said, I suspect he might be onto something, but he has to come clean about any secondary gain he might have in this. So where does that leave bloodroot/ZnCl paste. In my view � no closer to justifying its use in its current form, and in the manner being promoted. The potential risks in using it without appropriate supervision and direction, or in unregulated forms without quality control are greater than any potential benefit over conventional therapy. Also even those practitioners � such as Dr Mohs, Dr Brooks and others who have used, or are using it as a tissue fixative, are still relying on surgical excision and histological analysis to confirm eradication of cancer. Perhaps there is a role as a adjunct treatment as Dr Brooks suggests, but I don't see it as appropriate as a curative treatment on its own. In regards superficial BCCs, Actinic keratoses and other �pre-malignant� lesions, approved topical treatments are available. Almost all suspicious skin lesions should be biopsied and treated by or under supervision of an experienced skin cancer professional. And I just don't see it as a conspiracy issue. There is no coordinated effort to withold information from the public � on the other hand � it is quite easy to find plenty of information on black salve etc. It is up to people to review all information with a critical and sceptical approach. But until the proponents take the time to standardise the product, and subject it to quality control and repeatable experiments, no regulator is going to approve it for human use. I believe it is a cost issue for many people. Unfortunately dermatologists (especially in the USA) are expensive, and even here in Australia, the skin cancer capital of the world, it is difficult to find suitably skilled and qualified doctors who can diagnose and treat skin cancers. PS. This will apparently also become less affordable with the Government about to increase the cost of Medicare to patients. Thanks for reading. "I will prescribe regimens for the good of my patients according to my ability and my judgment and never do harm to anyone. But I will preserve the purity of my life and my arts." .... Means a Damn thing in our world of corporate medicine ? anti-psychotics that had me reacting a large amount of different ways until my father decided to get the law involved and took me home. Had I been treated properly in the fist place, nobody would have called me mentally ill nor would I have been subject to nightmares or any of the other maladies that accompanied my experience at that ghastly place. My family decided that a change of diet and not eating most of the sugar-filled junk made here in America was a much better route to living a life without seizures and liked me playing football,scuba diving and dating girls as often as I desired. Everyone I knew that went into chemo died soon thereafter, every woman I spoke with that had a lump in her breast that had it removed lived feeling like a mutation (if she actually lived after it). 97 percent of the time CHEMO DOES NOT WORK !! Yet oncologists are still allowed to get a commission if they sell it for use. What we have globally now is simply a huge market for Big Pharma and corporate entities that assume we will believe you can help a person in 20 mins and then handing them a ticket to buy a medicine. So, speaking about Dr Brooks having a financial interest in his ideas is nothing new within the medical community. But at least he had the noogies to look at a camera and tell the world that many other practitioners cannot (own) things within those sort of pastes and that is probably why using them is not very well known in the treatment of cancers. You sure sound like you have a certain amount of scientific knowledge to your credit but, if you went to school in Oz or the United States, you were probably trained by a medical school that was funded in part at one time by the Carnegies or Rockerfellers. For that reason alone, I have to doubt a lot of your conclusions here and your (snake oil) analysis of the topical pastes in question. I learned long ago that surgery on cancer can simply spread out the disease into a wider basis and if you are too numbed by medicine to realize how bad things had become, you may end up looking quite poorly because of that. I also learned that the (therapeutic level) given to patients these days can have them acting quite strange just like when I was a little boy and 2 of these people asked me to help them get off of pills and onto a different diet so they could be happy once again. Fortunately they were friends of mine and I did it as a favor without compensation which was the Christian thing to do in my view after hearing what had happened to them. Amazingly, both of them found a way to live without 3 to 5 different pills to take daily but were initially laughed at by the doctors who were treating them and told them they would need to come back and get refills. after seeing that it was not just me that had been over-medicated and then went on living a healthy lifestyle without a bunch of toxins inside of me. I have to say I am impressed that a medical doctor like Dr. Pete would take the time to come here and share his knowledge and opinion. He sure isn't making any money wasting his time here and that says a lot..at least he's out there looking and trying to help and learn. That said I don't completely agree with what he has said but need some time to put my thoughts and facts together before I do. I was VERY disappointed with his comment ..
" I have to call anivoc on this as the post was misleading to say " it is still the best tool in excising MELANOMA tumours ...� Wrong! A scalpel is the best tool for excising anything, the bloodroot paste is used as an adjunct to fix the tissue." I sure don't want to discourage Dr. Pete from posting here but we all have been down this road and opinions, be it from a doctor or lay person are fallible. I've been buried at work and still have a lot more to say but need to cut it short for today.. This is a great topic--really enjoying the back and forth. I have since my skin cancer dx become quite skeptical of opinions backed by what should work as opposed to what actually happens. You know, the honeybee has been "proven" not to be able to fly, but since it actually does, logically speaking, the scientific hypothesis is flawed. It's silly to argue that the bee is not actually flying, because it "can't". Black salve does work, vitamin C does work, baking soda does work to keep lesions at bay. I have a hypothesis as to why they work and it is based on anti microbial effects of these chemicals. My hypothesis may be wrong, just like those of all the scientists and thinkers who have gone before. While there is a certain satisfaction in using topicals, and I assume, in cutting out cancers, it's a short term solution. Black salve, Effudex, surgery are all essentially the same thing--removers of the diseased tissue, but not solvers of what made the tissue diseased in the first place. The recurrences are proof of that. The question is what changed in our bodies from our per disease state to our disease state. Thank you, AutoCorrect, you invention of the devil. Pre-disease state. I really commend all the people in this forum who are sharing knowledge and personal experiences about skin cancer. I plea to anyone who knows or has a direct personal experience or idea on how to tackle topically a �nasal mucosal melanoma� inside the nasal cavity. What alternative remedy would you suggest given the fact that obviously Zinc Chloride "bloodroot paste" would burn the entire area and it would be unbearable painful to deal with? Tom24, no experience, just ideas as to treatments you can look into. Interestingly, black salve is sometimes used on the skin above an internal tumor which is drawn out, ie breast cancer being drawn out through the skin. I think Ingrid Naiman's book "Cancer Salves" references this, and there is also a video on YouTube about a sarcoma and black salve. Visit the Earthclinic website and click on Remedies and then look at Hydrogen Peroxide. There is an inhalation protocol as well as an oral one. Consider high dose vitamin C (liposomal form). There is a 60 Minutes type program online about a man in New Zealand who was cured of cancer when his family got him on high dose vitamin C over the objections of the medical community. Gerson type therapy which advocates heavy vegetable juice intake as well as iodine supplementation. Iodine supplementation is used against breast cancer by a Dr. Derry. To me cancer is cancer--worth a try at least. Pancreatic enzyme therapy--reference Dr. Nick Gonzalez of NYC. For true topical use I can only think of Manuka honey and/or coconut oil as being bearable on nasal tissue. I think most of us struggle with the "smarting" issue in using topicals. I would think the Kiwi Medsafe website - despite their factual errors, or potential misleading statements discussed above, shouldn't be described as irresponsible. This is the formal advice from a government regulator.I think they are justified in cautioning against using a product that has not been submitted for evaluation as a therapeutic product, for which quality is variable, and based on the evidence they have, for which valid risk has been demonstrated in some cases..
Again I preface this with gratitude that Dr. Peter is contributing here I just, in this case, wholeheartedly disagree with this thinking. It is all about making well informed decisions. Be you a doctor or a lay person, going to a government site one will expect that the information there is ALL accurate...not some of it for each individual to have to sort out fact from fiction... Epistemology..."the study of the origin and validity of knowledge"
Here and anything on the internet that isn't "official" people know they have to question every statement and validate on their own before jumping into a protocol..
On a official government site like the NZ site, most people take what is written there like it was written in the Bible... cheating those people of making a properly informed decision. It is one thing to state cases where bloodroot was problematic and that based on these bad experiences the government does not recommend the use therein, it is another to post absolute untruths i.e. no formal studies. The official medical use and history of Bloodroot paste is there for the reading for those that chose not to believe the mudslinging baloney of it's use. Bloodroot paste is a powerful tool in the battle against skin cancers and deserve the same respect and understanding of the medical community as things like aspirin and penicillin which both have horrendous side effects in certain situations and cases. It isn't SNAKE OIL...it's one of many valid, realistic approaches to dealing with certain skin cancers and both doctors and lay people should be able to use it as such if after due diligence they choose to. To label it as something to not even consider is, in my opinion, an injustice to all who suffer from skin cancers. I am a naturopath working in Hobart. Patients are asking me about black salve. I am new to this forum and can't email users directly due to too few postings. Could you please contact me, I would like to communicate with you directly? All it takes is one post and then your options will work. The Mohs technique was developed in the 1930�s by Dr. Frederic Mohs, a general surgeon at the University of Wisconsin. This important development occurred while he was studying various injectable irritants to evaluate the live inflammatory response in transplantable rat cancers and normal tissue. Dr. Mohs noted that injected 20% zinc chloride solution inadvertently caused tissue necrosis in tumor and normal tissue. Further, he found that microscopic examination of this necrotic tissue showed well-preserved tumor and cell histology, the same as if the tissue had been excised and immersed in a fixative solution. This discovery was the basis for a method in which cancers could be excised under complete microscopic control. This fixed tissue technique was utilized for over a decade, with Dr. Mohs its pioneer developer, greatest advocate, and lone practitioner. Long-term follow-up of Dr. Mohs' patients was carefully documented and gave further testimony to the effectiveness of this treatment. In 1953 a revolutionary breakthrough occurred while filming the removal of an eyelid carcinoma for educational purposes. An involved margin in the first level caused a delay in filming, a development which necessitated the utilization of horizontal frozen sections for the second and third levels. This fresh tissue technique worked so well that Dr. Mohs continued to use it for most eyelid cancers. He also found the technique useful for small- and medium-sized cancers at other sites, and subsequently used the fresh tissue technique in the treatment of many other skin cancers. In 1969 Dr. Mohs reported the use of the fresh tissue technique for sixty-six basal cell carcinomas and for squamous cell carcinomas of the eyelid, with five-year cure rates of 100%. A corroborating series of data was instrumental in convincing the medical community of the validity of the fresh tissue technique, which had not yet largely replaced the fixed tissue technique. It is now well-established that the five-year cure rates using fresh tissue technique are equivalent to that of the fixed tissue technique. The fixed tissue technique is still recommended by some Mohs surgeons, however, for selected tumors. Recall talking to me on the phone, Anivoc? I have to admit, everything you said has turned out true. to have a few buffers in.